Sydney Maree, a former standout runner at Villanova and two-time U.S. Olympian, has been located in the South African prison system. 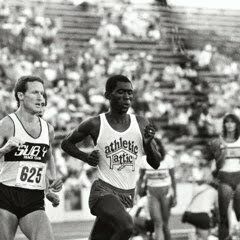 The subject of an Inquirer story on Oct. 20, Maree is a U.S. citizen and former world-record holder in the 1,500 meters (3 minutes, 31.24 seconds) who is imprisoned in his home country and serving a sentence of five years for a fraud conviction. Maree's location in South Africa's prison system had been unknown. He had reported to Leeuwkop, a maximum-security prison near his hometown of Pretoria, in June, but authorities then transferred him. Recently, Maree's location was released to the family. They report that he is in good health, although possibly sleeping on the ground because of overcrowding, at Odi Correctional Centre outside Pretoria. A cousin visited Maree at Odi and reported to Maree's sons and daughters that their father was in good spirits, although tuberculosis was rife and food scarce in the prison. Maree, 55, has dual citizenship in the United States and South Africa. Since The Inquirer reported on Maree's plight, a grassroots campaign to aid him has burgeoned. Maree's sons, Daniel and Pele, are spearheading the group that is made up of lawyers, consultants, academics, and friends. This campaign, Free Sydney Maree, soon will have a landing page on the Internet, organizers said. One of the lawyers, civil rights attorney Brian Wiley, was a runner in high school. 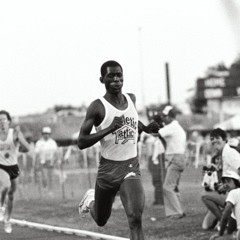 He followed Villanova's legendary running program that featured Maree. "He always had a quiet dignity about him, the way he ran with intensity and focus," Wiley said. "He was still always a gentleman. It was at the end, reading through the article, my jaw dropped. I learned that he had become an American citizen, that he had been a powerhouse in the economic redevelopment for an impoverished country, and that he had been tossed into jail without even fundamental due process like a speedy trial. The article went on to point out that there were more questions than answers." Wiley immediately called the American consulate in Durban and Johannesburg. Wiley and Tommy Cassidy, a Villanova graduate, are donating their legal services to the case. The pair have a three-pronged strategy aimed at securing Maree's early release. The crux of the approach will be pushing for Maree's "early humanitarian release," which the South African government granted to Nelson Mandela in 1990. To reach that point, everyone in the campaign understands, will take a snowball movement. "We are really eager for more people to contact us and to join the cause," said Daniel, who created the website www.mareevstate.com. "We need as much help as we can get. Although the momentum is building, we still need the help of even more friends and supporters." Daniel Maree, 24, has been trying to tell his father's story for the better part of a decade. Sydney Maree was arrested in 2004 for transferring the U.S. currency equivalent of about $120,000 from the National Empowerment Fund, of which he was chief executive, into his personal account. The NEF's mission is black economic empowerment in post-apartheid South Africa, a cause Maree had championed since returning to his home country from the United States in 1995. Throughout his trial, Maree maintained that his superior, Allistair Ruiters, had persuaded him to temporarily hide the funds, which would then be transferred to Deutsche Bank, an illegal payment, as part of a business deal. When the transfer was flagged, Maree said, his superiors closed ranks. The full $120,000 was returned to the NEF before Maree's 2004 arrest. Key evidence in the case went missing, and it took more than seven years from arrest to rejection of appeal. During that time, Maree's passport was taken away, and he is penniless. "I do a lot of civil rights stuff," Wiley said. "It's almost like a fairy tale. There's always a good guy. There's always a bad guy. There's always a dramatic conflict, and there's always some kind of angle underneath it if you push a little bit." It is really very helpful for us and I have gathered some important information from this blog.